14 D I V E R S I T Y W O M A N S p r i n g 2 0 1 8 d i v e r s i t y w o m a n . c o m as Ethiopia ranks third in Africa and eighth among the 22 highest tuberculosis- burdened countries in the world, accord- ing to the World Health Organization (WHO). Tigabu's work has garnered many awards. She was named the Rolex Young Laureate in Science and Health and won the Prix Jeunesse International and the Japan Prize multiple times. e Tech Museum of Innovation in San Jose named her a Tech Award laureate, and in 2012 Fast Company listed her among the 100 Most Creative People in Business. Tigabu, 36, realized that the initial round of children who watched her show was growing up. So to keep in step with them, she developed a line of age-appropriate picture books in English and Amharic. Gesu and Goshu Work Together and other titles showcase Ethiopian culture and pride. e most recent rollout is a TV show called Tibeb Girls, in which young Next B ruktawit Tigabu has spent her adult life helping others. Born in Addis Ababa, Ethiopia, and married to an American, she is CEO and cofounder of Whiz Kids Workshop, a company that spearheads innovative literacy programming for Ethiopians. Tsehai Loves Learning, a TV show about a female giraffe and her family—akin to Sesame Street—is now in its 12th year, with puppets fashioned in a living room in Oakland, California (where they live part-time). Addis Ababa's large population of homeless street children experienced perhaps their first and only "school" while watching an outdoor big screen. ere is no public preschool or kinder- garten in Ethiopia. e show not only pioneered teaching numbers and letters in the national language of Amharic, but also took on social issues, such as coping when a parent dies of AIDS. One-fifth of Ethiopian children under age 15 face such a loss. 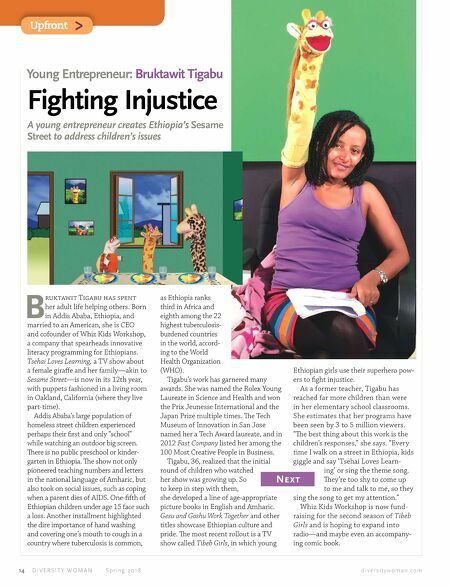 Another installment highlighted the dire importance of hand washing and covering one's mouth to cough in a country where tuberculosis is common, Young Entrepreneur: Bruktawit Tigabu Fighting Injustice Upfront > A young entrepreneur creates Ethiopia's Sesame Street to address children's issues Ethiopian girls use their superhero pow- ers to fight injustice. As a former teacher, Tigabu has reached far more children than were in her elementary school classrooms. She estimates that her programs have been seen by 3 to 5 million viewers. "e best thing about this work is the children's responses," she says. "Every time I walk on a street in Ethiopia, kids giggle and say 'Tsehai Loves Learn- ing' or sing the theme song. ey're too shy to come up to me and talk to me, so they sing the song to get my attention." Whiz Kids Workshop is now fund- raising for the second season of Tibeb Girls and is hoping to expand into radio—and maybe even an accompany- ing comic book.